The four GRM Tools bundles in one pack. 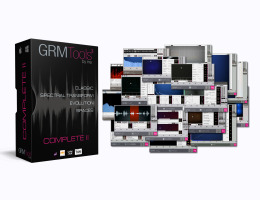 The GRM Tools Complete Collection is an un-compared set of 18 amazing plug-ins that have been used by most renowned composers and sound designers around the world. The GRM Tools Collection contains 18 AAX, RTAS, VST and Audio Unit Plug-ins and can also be used as Stand-Alone applications. An iLok account is required to authorize GRM Tools products. With the iLok License Manager, you can deposit your license either on a 'computer' or on the 'iLok Dongle. (iLok keys can be purchased from www.ilok.com or at your local dealer). Demo's available from the Downloads tab, here!